Since the rumbling protests of the Occupy movement last fall, some commentators have argued that while Americans have reason to be outraged, we here up north don't really have that much to complain about. Our bankers have pretty much followed the rules, and our economy has fared better than most others in withstanding the rough winds of the Great Recession. In one sense, these defenders of the status quo are of course right. Many more men and women south of the border have suffered directly at the hands of an economic system gone wrong. Yet, in another sense, this position fails to appreciate the broader context of the times. In the last couple of decades, Canada, like many other Western nations, has experienced rising inequality. (1) Naturally, this strikes people as dubious in a democracy. Furthermore, what's likely to spark off anger is the sense that, just as inequality is one the rise and the super-rich get richer, ordinary citizens feel that their social safety net is on the cusp of unravelling. The West is being caught up to by "the rest", with uncertain social and economic consequences. Quite plausibly, it could mean less jobs and lower income levels in the heretofore rich, Western democracies. With climate change and dwindling ecological resources, it may also mean higher energy and food prices. Certainly, it's worth protesting in the streets and squares to bring attention to these issues. But while it may be the job of politicians to come up with answers to these problems, in a democracy, responsibility falls on the shoulders of all citizens. Therefore, those who have ideas about how to tackle the situation of social unrest stemming from growing inequality and environmental destruction should bring them forth. In his most recent book, Filthy Lucre , University of Toronto professor Joseph Heath defends a set of ideas that move precisely in this direction. What he in fact proposes is an approach that governments can take to bolster equality without sacrificing economic efficiency - an approach he calls "opportunistic egalitarianism". The conversation that Heath invites us to partake in, about equality and efficiency, is an important one to have. This is especially true on the Left, where economic literacy is notoriously low. We'll see that the policy orientation he advocates may offer certain solutions for facing the troubled times ahead. Still, the deepening of economic knowledge is not an approach that will appeal to all those men and women who are morally outraged at the direction our society is taking. Furthermore, there are many who don't have much faith that government initiatives alone will lead us to sunnier pastures. And it's no doubt true, as Harvard economist Juliet Schor suggests, that sometimes change comes "from below", that is, from innovative subcultures whose ideas and actions spread to become the norm to which politicians must then pander. Currently, there is a swell of civic initiatives guiding the way toward more sustainable and egalitarian lifestyles. Schor believes that this diffuse European and North American movement holds the key to economic progress over the next century. 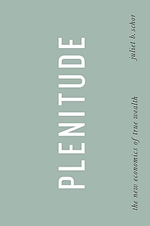 In her book, Plenitude: The New Economics of True Wealth, she draws insight from the movement in order to chart changes that ordinary citizens can undertake to help bring about a more just and sustainable future. We'll see that Schor's vision works in a whole other dimension than Heath's more policy-oriented proposal. But, then, one doesn't necessarily exclude the other. Indeed, perhaps the message to take home from these books is the need for a double mobilization. In Joseph Heath's view, one of the greatest challenges of the Left today is to create policies that will increase equality but will not, in the same stroke, sacrifice economic efficiency. Despite what is often claimed by the Right, Heath argues that there is no necessary trade-off between equality and efficiency. Egalitarian policies do not automatically generate a drag on the economy. Of course, such proposals must be carefully assessed. For if there is anything that social and economic reforms over the last half-century have shown it's that there is no magic bullet for solving the ills of poverty, exploitation and social inequality. Limits must also be recognized in the case of another favourite policy of the Left - corporate taxation. While the idea of generating revenues by taxing big corporations sounds good, Heath argues that governments cannot treat corporations as "magic hats" from which they can continually pull out revenues. There is the whole question of national competitiveness and growth, but there is also the more obvious problem that corporate tax increases will in all likelihood be passed on to ordinary citizens in the form of salary reductions and price hikes. These reservations don't mean that we should forget about such traditional reforms altogether. Indeed, they remain crucial to the continued advancement of social democracy. To be sure, corporate taxation alone is not going to solve all of our problems. But this doesn't mean allowing ourselves to be duped into accepting the Right's global race to the bottom, with ever-decreasing tax rates. Ultimately, the decision to raise or to lower corporate taxes needs to be considered in relation to other tax revenue sources. (4) Furthermore, this decision must be taken within the broader context of the relation between social equality and economic efficiency. Generally speaking, there are two dimensions to a society's overall efficiency. First, there is the question of productivity. Efficiency is increased when production is re-organized in such a way that allows us "to do more with less" - so, for example, making the same number of bread rolls, but with fewer trips to the market. Economic wealth is a matter of maintaining or even increasing output, while using fewer natural resources and at the same time freeing workers to do more worthwhile things with their time. (5) New technologies and an extensive research and development sector certainly help to achieve this kind of "productivity growth". But the competitive market system, with its inbuilt, often demonized profit motive, is itself a huge driver of efficiency-gains. Now, one should be able to appreciate these strengths, as Heath does, without being accused of bowing to the God of the free market. In any case, Heath's argument is that while a well-functioning marketplace is central to an efficient society, it's far from sufficient. The problem is that there is a spectrum of goods and services that the market mechanism is simply not suited to provide. Obvious examples include roads, bridges and water systems. We can also think of less tangible goods such as knowledge and clear air. Given that the market functions on the basis of the private property regime, it's a bad vehicle for delivering these kinds of "public goods". Typically, then, governments must ensure their provision. It made sense to do this since the problem of adverse selection, it turns out, can be solved by grouping the client base. This allows for predictability. From an economic perspective, the larger the group, the better. This is what's called the "law of large numbers" and it's what pushed governments to impose universal, mandatory insurance schemes. The introduction of health and other social insurances during the postwar period was, without a doubt, a great moment for social democracy. Yet it was also a concrete gain at the level of efficiency insofar as a dysfunctional system of risk-protection was transformed into a mainstream service. So, what does all this have to do with egalitarian reform today? Often, the Left misses the economic rationale behind public insurances such as health care and focuses solely on the egalitarian dimension. This is ironic given that the egalitarian part of the equation, which involved sidestepping complex actuarial calculations and drawing funds through progressive taxation instead, was, in a sense, "piggybacked" on the efficiency rationale of correcting a market failure. (8) In any case, it's this piggybacking effect that gets to the essence of what Heath means by opportunistic egalitarianism. Since governments had to intervene in the insurance industry for efficiency reasons, they took advantage of the opportunity to undertake the correction in a manner that would at once bring about greater equality. One of the first things to look for today, then, in accessing opportunities for egalitarian reform, is a situation of market failure. Perhaps the most obvious case is the non-priced environmental damage caused by certain types of economic activity. For example, the social costs of carbon-use are not included in market prices because air quality is not something that can be easily incorporated into the private property regime. Heath argues that this situation presents a classic case for opportunistic egalitarianism. Pretty much all respectable commentators agree that governments must put a price on carbon in order to ensure that the pricing system is efficiently managing demand according to relative social costs. And given the need to intervene, governments should at once take advantage of the opportunity to tweak their intervention so as to increase social equality. Democracy activists sometimes suggest that mobilizing in favour of government-led reforms is the only way to create change. No doubt, in a democracy, the importance of this should never be underplayed. If we're to avert looming environmental catastrophe and social unrest, governments must act. And for governments to initiate reforms for the greater good, citizens must be passionately engaged, in parties, unions and other organization of civil society. Juliet Schor, for her part, suggests that the way to meet today's social and environmental challenges is by building an "alternative economy". Further, while she grants that governments must play a role here, she argues that a good part of the work must also be taken up by a vigorous movement of local citizen initiatives. Schor is not proposing anything radically new. In fact, the movement she refers to has already begun, going by names as diverse as "voluntary simplicity", "downshifting", "slow food", "transition towns", and so on. Schor believes that initiatives such as these hold the promise of reorganizing economic skills and habits so as to create a feasible alternative to the "business-as-usual" economy that is now jeopardizing the planet's future. In this view, what is just as important as citizens arguing in favour of this or that party platform is for them to begin lending a hand in the forging of sustainable production and consumption practices. In the face of these gloomy possibilities, the men and women spearheading the sustainability movement may be seen to be taking proactive steps toward building an alternative economy. Insofar as the movement has already begun to take root in pockets across Europe and North America, Schor deciphers several principles at work - principles which can serve as guideposts for the movement's further expansion. She calls these the principles of "plenitude" thereby giving her critical glimpse into the future a positive spin. The first principle of plenitude involves what she refers to as a new allocation of time. The idea here is that there exist opportunities outside of the traditional labour market where citizens can productively invest their time and energy. Just because there is no exchange of money doesn't mean these opportunities cannot yield important economic returns. At a minimum, a cooked meal, a completed tax form and a cared for child are valuable economic goods. Likewise, trimming the fruit trees in the backyard, building a solar panel or revitalizing the soils of a local green space are also valuable forms of work. Under conditions of ecological depletion, job and income scarcity, the idea of sharing one's time between specialized paid employment and more general domestic and green labour makes perfectly good economic sense. On the one hand, this will free up remunerated labour hours for the unemployed. On the other hand, it will increase the economic autonomy and stability of households. In balancing off specialized and general skills, workers are no longer putting all their eggs into one basket. By diversifying their skills, they're also spreading their risk. The third principle of plenitude involves what Schor calls "true materialism". In using this phrase, she is emphasizing that plenitude is not a paradigm of sacrifice. In a sense, the plenitude model envisions a society in which citizens would actually be more materialistic, paying greater attention to everyday consumption decisions. True materialism suggests that consumers would evaluate their purchases not only on the basis of utility and beauty, but also on the basis of ecological impact - the "footprint", that is, which is left in the wake of their everyday decisions. The first step toward true materialism requires breaking the "fast fashion" spending cycle. This is a cycle based on the exploitation of tastes and fads such that clothing products - but also electronics, furniture, vehicles and even houses - are cycled through the economy at an increasingly fast pace, thereby leading to vast amounts of waste. The counter-philosophy to this is one in which we spend more time shopping around, yet ultimately buy less stuff and find more meaning in the stuff that we do buy. All of these emergent forms of consumption create possibilities for diminishing our impact on life-generating ecosystems such as oceans, soils, wetlands, forests and the atmosphere. There is another upshot as well. Just as with high tech self-provisioning, the new consumption practices tend to strengthen social ties and connections. Whether it's bulk buying or tool-sharing, on the plenitude model, consumption tends to be a more collaborative endeavour. This brings us to the fourth and final principle of plenitude, that is, community. What Schor means by community is the organic linkages of reciprocity that arise from relations of economic interdependence. So, for example, when friends and acquaintances collaborate on a self-provisioning project, they're also capitalizing on "reciprocal labour transfers". Schor compares this mutual, lending-of-a-hand, to a secondary banking system, where instead of depositing and withdrawing money, it's "labour hours" that constitute the common currency. This week I help you with the rooftop garden, next week you help me rig up a solar-powered household appliance. Ultimately, with communities forming around local economies of reciprocity, a type of informal insurance policy takes root, offering greater resourcefulness for dealing with an economically and ecologically perilous world. The two books reviewed in this essay are about how to deal with the murky economic waters in which Canadians now wade, alongside citizens from other Western nations. The books are also about the ecological crisis. Filthy Lucre argues that the Left needs to become more economically literate in order for leftist parties and governments to face the challenges of the day in a creative yet feasible manner. (16) Plenitude, for its part, argues that while mainstream politics is an important means for grappling with the problems of social equality and environmental sustainability, it's not the only means. Game-changing reforms can also be brought about "from below". These two different approaches to dealing with contemporary challenges - official democratic politics, on the one hand, and lifestyle changes on the other - are likely to appeal to two different types of people. Yet perhaps the two can intermesh, such that sustainability activists learn a little about the people and ideas that make up an organized political vision, and where these people, in turn, get more involved in the sustainability movement. In any case, what each of these strategies reject is a position of lax spectatorship. Both require that citizens get more involved, at some level, in order to address the pressing issues of the day. This review has shown how the objectives of equality and sustainability can be threaded together in different ways. So, for example, governments can fund poverty-fighting programs by putting a price on carbon, which would at once help to slow climate change. A shift to plenitude lifestyles, on the other hand, would open the way toward a "shorter workweek", which would mean an expansion of non-market forms of ecologically restorative labour, as well as an increase of remunerated work opportunities for the poor and unemployed. Ultimately, while there is no inherent link between social equality and the environment, it's no surprise that people of broadly leftist sensibilities - people that Heath refers to as "friends of humanity" -should be fighting on both of these fronts. It can be hoped that these books will encourage those who are morally outraged at the way things are going in Canada and elsewhere, yet who remain idealists at heart, to go out and get more involved in the activities of the ecological left. One of the great contributions of these books is that they give men and women the tools to do this in an enlightened and economically coherent manner. Andrew Gibson has recently returned from Cairo, Egypt, where he was conducting postdoctoral research with the Egyptian labour movement. Presently, he is working as a consultant for Canada's federal civil service. He is also active on the Environment Committee of the NDP, and as secretary of the Montreal-based NGO, World Cooperation Project. 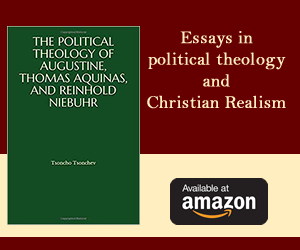 His doctoral dissertation examined the Canadian social criticism of philosopher Charles Taylor. 1 In the economics blog Worthwhile Canadian Initiative, Steven Gordon draws a distinction between "first order" and "top end" inequality, where the former refers to a worrisome divide at the centre of the population and the latter, near the top end only. In Canada, studies suggest that while first order inequality began to grow in the 1980s, it stabilized somewhat in the 1990s. Top-end inequality, however, continued to rise. For a detailed account of these changes see Lars Osberg (2008), A Quarter Century of Economic Inequality in Canada, 1981-2006. The moral and democratic implications of each of these types of inequality are a matter of much debate. 2 Some worker cooperatives, it's worth noting, are less susceptible to infighting than others. Coops which have only one category of worker, e.g. taxi coops, tend to be easier to run. With large, heterogeneous coops, on the other hand, the risk of infighting exists not only among worker-owners, but also with management that is hired on contractual terms. 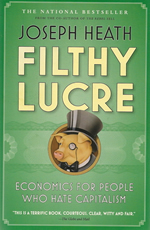 See Joseph Heath (2009), Filthy Lucre: Economics for People Who Hate Capitalism, pp. 190-95. And for a more general overview see Henry Hansmann (1996), The Ownership of Enterprise. 3 The alternative, Heath suggests, is for governments to be active in drafting laws for private corporations that actually serve the public interest. Whether it's with regard to working conditions or, say, environmental standards, once governments get the legal and financial incentives to stick, corporations become relatively easy to manipulate. Just as seals can be trained because of their appetite for fish, "corporations are also relatively easy to control, because they have an appetite for money". The ultimate objective may be social in nature, but the beneficial effects arise in response to a single, coordinated, financial incentive. Filthy Lucre, p. 199. 4 Ensuring sufficient state revenues is a matter of drawing from all of these different sources. Some of these, such as corporate taxes, are typically considered more progressive than others, such as a flat sales tax. But if they're a drag on the economy, then, arguably, they're not helping anybody's welfare. Furthermore, given that investing in public services by way of taxation is typically a leftist aim, sales taxes should not be dismissed out of hand. Rather, they should be carefully scrutinized as a component of a larger, finely designed system. As Heath puts it, big-spending governments "need to operate more efficiently, and they need to work harder to get the incentives right. once you start pushing middle tax brackets above 30% or the retail sales tax above 10%, tax evasion starts to become a bigger and bigger problem. It then makes sense to streamline the income tax system, or switch to a value-added tax, which is more difficult to evade and less costly to enforce. This is precisely what big-spending European states have done. They have also switched the type of taxes they impose, away from ones that have the most deleterious impact on growth (mainly taxes on investment and corporations)", p. 59. For further insight on this issue see Peter Lindert (2004) Growing Public: Social Spending and Economic Growth since the Eighteenth Century, as well as Henry Mintzberg, "Managing Government, Governing Management", Harvard Business Review 74, 1996, pp. 75-83. 5 In an evolving economy, people who used to undertake tasks which can now be accomplished more efficiently are freed to do other work, or simply to enjoy their free time. Despite what is often said in debates about job-creation, this process is the cornerstone of economic progress. For, as Heath observes, work is generally considered something that is to be avoided. He continues to say that "absent the specter of mass unemployment, it would seem fairly obvious that being able to achieve the same result with less effort is better than being able to achieve it with more effort." The idea here -which is that our objective should be to create wealth, not jobs - is nicely illustrated in a story by Dwight Lee. It's the story of "an engineer who, while visiting China, came across a large crew of men building a dam with picks and shovels. When the engineer pointed out to the supervisor that the job could be completed in a few days, rather than many months, if the men were given motorized earthmoving equipment, the supervisor said that such equipment would destroy many jobs. 'Oh', the engineer responded, 'I thought you were interested in building a dam. If it's more jobs you want, why don't you have your men use spoons instead of shovels". Filthy Lucre, pp. 217-218. See also Lee, "Creating Jobs vs. Creating Wealth, The Freeman (2000). 6 Economists call this "Pareto optimality", which refers to the constant shifting of production and consumption out of some sectors into others based on scarcity factors. The end is to maximize the availability of goods that the consumer public most wants, or, in Pareto's lingo, to make some people better off without worsening anyone else's condition. Heath notes that even the great socialist thinkers of the 20 th Century, such as Abba Lerner and Oscar Lange, recognized the crucial importance of scarcity pricing. Markets, however, aren't the only way to create efficiency. Indeed, sometimes they can have just the opposite effect and must be corrected by government intervention, as shown in Heath's analysis of "market failure". 7 The accepted definition of public goods used to be a set of goods that was: "nonexcludable - you couldn't prevent anyone from enjoying them - and nonrival in consumption - one person's consumption did not diminish the quantity or quality of anyone else's." But Heath points out that it's wrong to draw too sharp a distinction between public and private goods, preferring rather to speak of what economists call "club goods", which are a type of good with an "optimal sharing group" of more than one. Heath redefines a public good as a club good that has an optimal sharing group of the entire population, or, the "club of everyone". Filthy Lucre, pp. 85-89. 8 It's worth noting that the problem of adverse selection in the insurance industry is just one type of market failure - that is, a non-optimal or inefficient allocation of resources, where at least one person's welfare could be improved without decreasing that of others. Another type of market failure, linked to carbon emissions and to pollution more generally, has to do with the problem of "negative externalities". Others include the problem of positive externalities, natural monopolies and business cartels. For more on the history of market failure see Steve Medema (2009), The Hesitant Hand: Taming Self-Interest in the History of Economic Ideas. 9 Another example of opportunistic egalitarianism that Heath explores stems from the negative externality of "one-upmanship" which he sees as a byproduct of consumerism. While highly wasteful, Heath argues that consumer based status-competition is here to stay. So why not then find a way to use it to beneficial effect. An example of how this could work is the (RED) brand launched by Bono and Bobby Shriver, which partners with companies like Apple, Sony and Nike to sell specially marked goods, for which part of the profits go to the Global Fund to fight AIDS in Africa. Filthy Lucre, pp. 296-97. 10 In referring to Beddington Zero, the South London ecovillage, Schor comments that "those in the vanguard of sustainability" have found their life purpose in dedicating themselves to the cause of saving the planet. She continues to note, however, that "for the vast majority of us, ecological living is not the object of our passion. We will understand that it's necessary and may enjoy it. But deep meaning is found elsewhere, in family, friends, personal creativity, religion, music and art, social justice, science, business, or helping others. Plenitude as an economic model cannot supply that meaning: it can only help achieve it.If your work and primary activities give you that satisfaction already, the approach should help you to find more, or protect what you have. If you are still searching for work that is truly meaningful, it will expand your options by reducing what you need to earn. There's just one planet, and for each of us, one life", p. 100. 11 Juliet Schor (2010), Plenitude: The New Economics of True Wealth, p. 99. 12 To learn something about Bergmann's pioneering self-provisioning projects in Flint, Michigan, see his article "Ecology and New Work: Excess Consumption and the Job System", in Juliet Schor and Douglas Holt (2000), The Consumer Society Reader. 13 The focus on knowledge is part of a larger restructuring of patterns of abundance and scarcity. The plenitude model is, as Schor puts it "parsimonious in the use of natural resources and a heavy user of what can be comparatively in surplus- time, knowledge, technology, and, as we reconstruct it, community". Plenitude, p. 20. 14 The "scale" versus "performance" debate is a contentious one among economists. Everyone agrees that bigger companies are able to benefit from economies of scale. But smaller firms may also benefit from such economies by networking together. On the flip side, their rapid adaptability allows them to achieve efficiencies that big corporations cannot. Furthermore, as Schor notes, "the rising cost of energy will favour more local and regional economies made up of smaller firms. The export-led, fossil-fuel dependent globalization of the last few decades has relied on artificially cheap long-distance transport, and that is unlikely to continue." Plenitude, p. 156. Recent literature on the scale vs. performance debate includes Michael Shuman (2006), The Small-mart Revolution: How Local Businesses are Beating the Global Competition and Yochai Benkler (2006), The Wealth of Networks: How Social Production Transforms Markets and Freedom. 15 "Fab labs" is short for digital fabricators. For MIT physicist Neil Gershenfeld's vision of fab lab technology see his Fab: The Coming Revolution on Your Desktop (2005). 16 For part of the Left's constituency, overcoming what Heath calls the "scandal of economic illiteracy" requires, first, accepting that the market economy is the only viable system of economic organization. Once the market genie is out of the bottle, there's no putting it back in. Acknowledging this, the key question then comes to hinge on how the market is best to be managed, that is, "how humane and inclusive the system is to be". Filthy Lucre, p. 227.